The next morning he set out to see if he had caught the wind. Upon arriving he beheld a man with big ears and of great stature. “Well,” he said, “so you are the person that has been tearing my wigwam up, eh?” With that he pulled his ears right and left, kicked him on the nose, and slapped him till he had him begging for mercy. 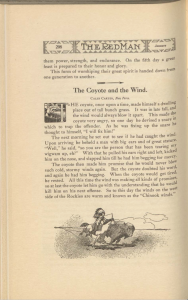 This entry was posted in Caleb Carter, Nez Perce, The Red Man, Tribal Educators, Trickster Tale and tagged animals, Coyote, Etiological, Humor, The Red Man, Trickster, Wind. Bookmark the permalink.